Thank you for your suggestions of possible follow-ups to my Random Borough project. There are too many places to visit, so the task isn't "completable". » Random Mainline Station: There are 357 of these. Even at one a fortnight, that's going to take 15 years. » Random Street: The index of my London A-Z has more than 160 pages of street names. It's so not doable (and very dull). » Random Postcode: There are 242 of these. Some of them are tiny. Even the SE postcode has 28 subdivisions. Something postcode-y might work, but not "random postcode". » Random Park: The Royal Parks are an obvious starting point, but then there are so many more, and then so many smaller green patches after that, and where do you stop? » Random Blue Plaque: There are more than 800 of these in London. And if I picked one at random, it probably wouldn't be anybody interesting. The list isn't suitably defined, so the task is highly subjective. » Random Bridge: Over the Thames, over other rivers, over railways, over roads, over-many! » Random Roman site: Wikipedia lists just over 100 Roman sites in England. Rather fewer are anywhere near the southeast, and not all of those are accessible. » Random Old London village/district: That's places like Bloomsbury, Spitalfields, Bow, Dagenham, Heath Row... endless! » Random Street Market: Portobello and Walthamstow, obviously. And Shepherd's Bush and Romford. But Earlham Street and Sutton Farmers? And...? I've been to too many of them already, so it'd be nothing new. » Random County Town: Ah but I've done Winchester, Chichester, Kingston, Oakham, Oxford and Hertford already. Although I haven't done Aylesbury, Bedford, Cambridge, Chelmsford, Lewes, Ipswich or Maidstone yet, to name just the local ones, so maybe there's something to this idea. » Random Tube Line: I've already scrutinised the entire Jubilee, and most of Betjeman's Metro-land, plus all the middle of the Bakerloo. » Random London Boroughs pre 1965: Most modern boroughs are two or three of these put together, so it's unlikely I'd have much more to add. » Random Borough Reprise: Many of you think I should go back to the beginning and visit each of the 33 boroughs again. The trouble is, although some of the places have changed a lot, most won't have done. There'll be just as few interesting places to visit in Harrow as there were then. It is very tempting to go back to Merton, because I gave that short shrift eight years ago. But no, sorry, job done. The sites are better visited sequentially, rather than randomly. » Random Street (one street per letter): Hmm, an A-Z of London streets. That could be interesting, but not in a random order. » Random Thames Bridge: Definitely of interest, but would be far better done in order. 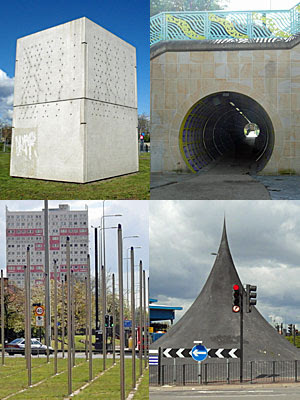 » Random British City: Good, good, there are only 50 English cities, so this is doable. But if I'm picking them at random, the cost of travel (and in many cases an unexpected overnight stay) would be astronomical. » Random Arrondissement: The Parisian version of Random Borough. Wouldn't that be great? Just entirely impractical. » Random London Society: That's so not me, it's far too sociable. Plus, I suspect, difficult to randomly schedule. » Random Pub: That's so not me either. I'd be able to tell you what the lounge bar looked like, but there'd be no critique of the atmosphere or the real ales. » Random National Cycle routes: No bike. End of. » Random Motorway Services: No car. End of. There's only a limited amount to write about. » Random Tube Termini: This was a very popular choice. 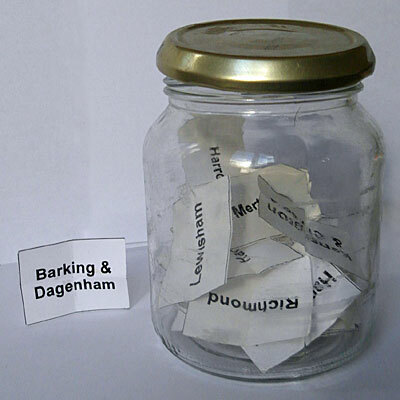 Say I stick 11 tube line names in a jar, pick one, and then go and explore the ends of the line. For the Piccadilly line, for example, that's Heathrow, Uxbridge and Cockfosters. Might work. But if I concentrate on the stations, that's a bit limited. And if I wander around outside, then you've probably heard it all before. » Random Railway Terminus: I go to Victoria or Waterloo or wherever, and I take the next suburban train out to the end of the line. Could be Tattenham Corner, could be Hayes, could be Shepperton. It's not sounding like a rich list of possibilities. Hmm, might work, but I'm not sure people would be interested. Yesterday morning, while you weren't watching, the London 2012 Olympic website updated. It's slipped into Games mode - no longer focusing on preparation, but concentrating on sport. When the eyes of the world alight on London2012.com they won't be interested in building sites and Games Lanes, they'll want to know when the cycling's on and who won medals in the canoeing. But there's plenty of information for spectators if you drill down, including some I've not seen elsewhere before. So here are some snippets I've gleaned, in case you're one of the lucky millions with tickets (or even if you're not). Yes, it's true, security paranoia at London 2012 will be similar to trying to board a plane. Welcome everyone, to Stratford International Airport. If you wander up to security with a cup of coffee, it's going in the bin. If you bring a can of Coke, let alone a can of Pepsi, it's going in the bin. If you stick a yoghurt in your packed lunch, it's going in the bin. The same goes for bottles of perfume, spray-on deodorants, hair gel, hand sanitisers, cough syrup and toothpaste. As we all know, liquids are the chosen medium through which international terrorists seek to wreak havoc on the world... despite the fact that none of them yet successfully have, but they might, so be very very afraid. The ban's clearly pointless, given that would-be evil masterminds could have bought 20 tickets to the hockey or synchronised swimming, allowing their group a total of two litres, which is more than enough to build a bomb in a toilet cubicle, but don't let that worry you. Some might see this rule as blatant profiteering for Coca Cola, the sponsor with exclusive rights to sale of liquids within Games venues, but rest assured there is an alternative. Empty drinks canisters will be allowed, so long as they're not glass, and so long you emptied them beforehand. Free drinking water will then be available inside all venues, so you can fill them up for nothing and quench your thirst in the grandstand. Phew. Full list of restricted items here. » Near the stadium there'll be two separate gardens, the Great British Garden and the 2012 Gardens. » The far end of the Park, along the river, will be mostly park. The bit where the Manor Gardens allotments once were will be a Live Site, sponsored by British Airways, where you can watch the events like everyone else at home but on a bigger telly. » A three mile walk, guiding you round all the artworks and pretty landscape features, will be signposted by butterfly icons. » There'll be four London 2012 shops, one of them a Megastore, in case you still haven't bought all the branded teatowels your kitchen needs. » The biggest McDonald's in the UK appears in the key, but somebody's forgotten to position it on the map. It'll be located in World Square... where alternative street food will include Chinese noodles, Mexican burritos, coffee and crepes. 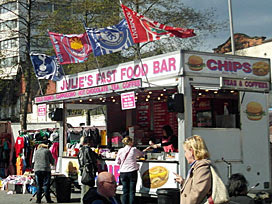 British classics such as fish and chips, roast dinners and curry will be available elsewhere in the park. 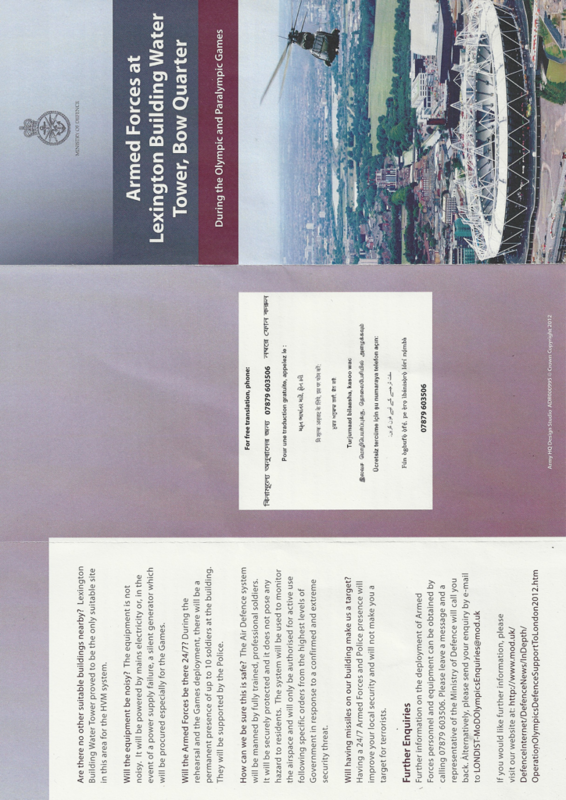 » Tickets for the Orbit observation tower will be available at the London 2012 tickets site only. It'll be open for lift rides to the top, and for walks down the exterior spiral staircase, but only for the four weeks of the Games. And then the Orbit will be closed again, until "late 2013", which is one hell of a mothballing for something that was supposed to be a world class tourist attraction. » Near the foot of the Orbit will be the Official Pin Trading Centre, for all the spectators with a pin badge fixation, sponsored by Coca Cola. Don't all rush, will you. Now that my eight year Random Borough challenge is complete, I'm not quite sure how to follow it. I've considered Random London Station, but there are far too many of them. I've wondered about Random London Postcode, but some of those are tiny. I've debated Random Home Counties Urban District, but that's not exactly catchy. I've mulled over Random Town Within 50 Miles Of London, but you wouldn't be interested. And I've contemplated Random Seaside Resort, but I've done too many of those already. I suspect that Random Borough is an impossible act to follow, the perfect mix of compactness and complexity, so I probably shouldn't even try. So there you go, my Random Borough project is complete. From 33 names in a jamjar to 33 write-ups on the blog, all delivered in just over eight years flat. What a bloody stupid thing to have done. I mean, what idiot sets aside four Saturdays a year to visit God-Knows-Where, just for the sake of it? What idiot decides that the best way to visit London is borough-by-borough, putting far-flung Hillingdon on a par with Westminster? What idiot then forces himself to write thousands of words on the subject, to an imminent deadline, across a set range of fixed categories? And all this for no reward, save the satisfaction of a job complete. Surely I should have better things to do with my time? And yet, what a brilliant thing to have done. I've been forced to visit the whole of London, even the suburban fringes, in small well-defined chunks. I've got a mental picture of dozens of previously unvisited locations, from Hook to Hainault and from Crews Hill to Crayford. I've developed a much broader understanding of how the capital fits together, both at macro and at micro level. I've been forced to find ordinary places interesting, and been pleased to discover that they are. In short, I've developed an overview of London that I bet you haven't got. I didn't realise what I was letting myself in for when I started out. I think I thought my trip to Merton might be a one-off, and gave it a fairly brief write-up as a result. But when I returned to my jamjar three months later and thought, hell, why not pick another, then I was hooked. There were times when I wished I hadn't started - for example waking up at crack of dawn to pick my destination and discovering I was 'only' going to Hackney, or slogging through a third consecutive evening of detailed post-visit documentation. But I never had any doubts I'd visit the lot, because I am at heart a serial completist. Hell, I've been writing a diary for 35 years, without gaps, so forcing myself to visit 33 boroughs was nothing tough. Having analysed every borough in town, I can categorically state without any shadow of a doubt that the most boring borough in London is Sutton. I'm sure most Londoners don't even know Sutton exists, let alone know where to place it on a map. I'd put Harrow in second place, definitely, but I'm not sure I could easily judge who's third. Neither could I pick a favourite borough, but I was unexpectedly impressed by Hounslow, which punches well above its weight in terms of local interest, and of course by Barking and Dagenham. There have been several boroughs I realised I hardly knew at all until I picked them, like Bexley and Barnet and Redbridge, so it's been great to make their acquaintance. There are others I thought I knew, like Camden and Lewisham, where picking them forced me to uncover fresh delights. But randomness didn't always deliver. Richmond, for example, would have been marvellous in sunny July, but I picked January and the entire trip was disfigured by freezing wind and rain. If one of my borough jaunts has inspired you to visit a part of London you'd not normally have considered, then job well done. There's so much more to the capital than the same old places in the centre of town, so it's refreshing sometimes to resist the pull of gravity and head further out. You wouldn't want to do it too often, but why not pick the occasional suburb on the outskirts and see what it has to offer? If nothing else it'll make you a better Londoner... it has me. Goresbrook Park: Several improvements were planned over several years, including turf seating, wildflower bands and wooden decking. Alas all were mindlessly destroyed by vandals in the summer of 2003. Project suspended. Scrattons Farm: Rather than look at a brick viaduct wall all day, residents of Scrattons Terrace now look out across a lansdcaped slope, scattered with sabre-like lighting columns, and currently blessed by a riot of thick almond blossom. For a fairly small borough, Barking and Dagenham has bred more than its fair share of sporting legends. Martin Peters, England World Cup goal scorer. Terry Venables, Spurs and England manager. John Terry, the ill-behaved Chelsea and England captain. 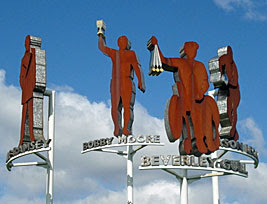 But they're not important enough to have been immortalised in silhouette above the A13 at Goresbrook. Four steel cut-outs rise from a mound on Castle Green, and if you drive by slowly enough you'll catch the names [photo]. First up Sir Alf Ramsey, our blessed World Cup manager, born in Dagenham. The man next to him holding the silver cup aloft is Bobby Moore, world-class hero, born in Barking. Alongside with the rugby ball is Jason Leonard, much-capped prop forward, born in Chadwell Heath. And completing the quartet is Beverley Gull, who I had to look up when I got home, although the gold medals and wheelchair were a big hint. She's a Paralympic champion, breaker of 13 world records in swimming, and is absolutely not the token woman and the token disabled person on this hill. Indeed she grew up in a house in the very street below, and was present (along with Jason, and Bobby's wife) at the grand unveiling in 2008. The sculpture also celebrates Barking And Dagenham's status as an Olympic Host Borough, even though not a single Games event will take place here, but that's the lickspittle nature of sporting politics for you. Building the Becontree Estate used a lot of gravel, and for years the pits lay disfiguringly to the east. And then someone had the very good idea to turn the area into a country park, seeded with wild grassland and planted with small trees. Eastbrookend is really big, as you'll know if you've ever looked out of the window of a District line train between Dagenham East and Elm Park and wondered what that really big green space was. 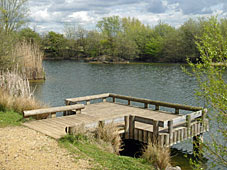 In the northwestern quadrant is The Chase Nature Reserve, with wooded byways and lakes for fishing, and in the middle of that the Millennium Centre [photo]. It's a pioneering example of sustainable development, complete with wind turbine, recycled aluminium roof and non-intrusive foundations. I was pleased to find the building open, then spooked out to be the only person within. The so-called "exhibition" was a few lacklustre panels, the viewing platform upstairs was almost reachable but locked, and every thick wooden door closed with a silent thud. The cafe appears to close at weekends, which is bad news if you're seeking probably the best value meal in London - a sandwich, crisps and any drink for £2. If you ever want to judge levels of affluence in London, cafe prices are a damned fine indicator, and the clientèle round here sure aren't affluent. Nevertheless the country park's a fine natural hideaway (Pete agrees), and springs to life for the annual Eastbrookend Country Fair on the first Saturday in June. And finally (really, finally), let's go stand in a hedge. A hedge in the northern tip of the borough, near Mark's Gate, above the A12. Somewhere on the other side of this hedge used to be the Manor of Marks, one of the medieval manors of Dagenham, now subsumed beneath a quarry for extracting gravel. For centuries all this was royal forest - Hainault Forest - covering tens of thousands of Essex acres. 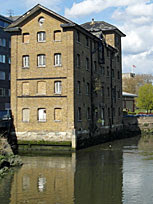 The southern boundary was the old road from Ilford to Romford, and the northwestern boundary was the River Roding, but the eastern boundary needed to be set in stone. 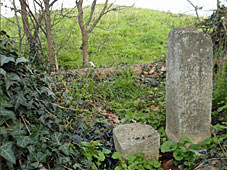 A number of boundary markers were erected so that people knew precisely where King James's side ended, and some of these still survive today. One (Warren's Stone) has been moved to the lawn outside Valence House, while another on the verge of the A118 (Havering Stone) still delimits today's borough boundary. I went in search of Mark's Stone, armed only with the knowledge that it was in a hedge to the east of Whalebone Lane North. It took a while to find - not in the cemetery, not in the cottage garden - until I spotted a gap littered with crisp packets, carrier bags and burger wrappers. There should have been two stones here, both Grade II listed, one from 1641, the other 1772. The younger marker's still there, entirely illegible, but the older appeared to have been snapped off over the last decade and only an embarrassed stump remained. Or more likely I was looking from the wrong side, and it's the older that's survived, with its inscription on the far side I never thought to check at the time. So let's leave it there, my random borough journey, standing in a hedge opposite a housing estate looking at the wrong side of a mostly-irrelevant vandalised monument [photo]. Seems a sort of fitting way to end. 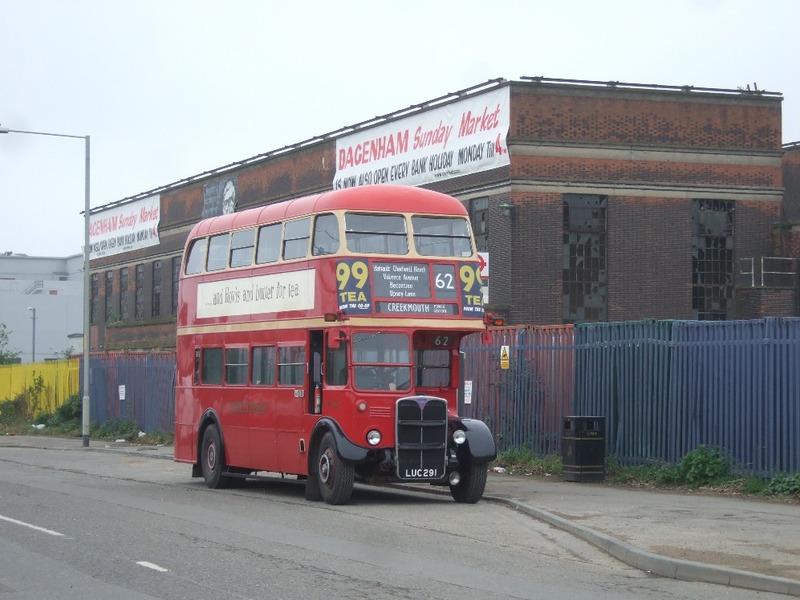 There's only one famous place in Barking and Dagenham, to be frank, and that's the Ford Motor Works, opened in 1931. It's located here thanks to a major flood two centuries earlier when the Thames broke through river defences to create a large lake - the Dagenham Breach. Upgraded later to a deep water dock, the ease of shipping in coal and steel made this an ideal spot for the largest car factory in Europe. One of the early vehicles off the production line was the Model Y, a saloon in competition with the Austin 7 - both vehicles with "an almost unbelievable lack of brakes" (and careful drivers). After the war came the Anglia and the Cortina, as well as worsening industrial relations, until the Fiesta proved to be Dagenham's final four-wheeled output in 2002. More than ten million cars were built here, and you can still see several on local streets where a strong brand loyalty remains. The vast site still churns out engines, apparently one in four Ford engines worldwide, but the days of high production and high employment are long gone. You won't get close to the main plant on foot, but you can catch the 175 bus into the heart of the works on any weekday or before 7am on Saturdays. Damn, missed. The wind turbines on site are visible across much of East London, forming London's first wind farm, and they're 120m from ground to top of rotor [photo]. 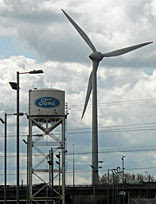 Visible closer by are two elevated water tanks painted with the Ford logo, which rise up beside the Channel Tunnel Rail Link (which bisects the site) [photo]. And somewhere in Ford's 475 acres, as a throwback to the storm event that gave this place life, the lake-like remains of Dagenham Breach ripple on. Dagenham Dock is an amazing place, probably for all the wrong reasons, as I've described in some detail on a previous visit. A railway station serving industry rather than housing, plus a bus station serving almost nobody, beneath a thundering arterial viaduct, close to wind turbines and a power station [photo]. There are plans for considerably more commercial activity here - it's ideally located - but thus far (apart from Ford) there are only a few strips and scraps down to the river. Chequers Lane is the preserve of lorries, not somewhere you'd ideally want to go on foot. Along one side is the new Barking Power Station (a mega-magnet for pylons) and on the other a Hovis distribution centre (plied by yellow articulateds). Don't walk all the way down to the desolate end, turn right past the drinks deployment warehouses and the integrated logistics hubs. And don't worry, it gets better. Once the warehouses stop, the grass begins. Ahead is the Ripple Nature Reserve, a huge expanse of green hummockiness, accessible through a gate to the south of Choats Road [photo]. It's all been reclaimed from dried-out lagoons of Pulverised Fuel Ash (mmm, lovely), and the unusually alkaline soil supports rare plants such as marsh orchids. Along one edge runs the Gores Brook, one of the borough's non-event streams, wiggling through the reeds on its way to an estuarine outfall. I thought I'd be alone here on the grassy mounds, but a single birdwatcher had also taken advantage of the sunny morning to come and peer at atypical wildlife through his binoculars. Down by the Thames came an uninterrupted view across the mud to Thamesmead [photo], then past a black jetty to the incinerators of Bexley [photo]. 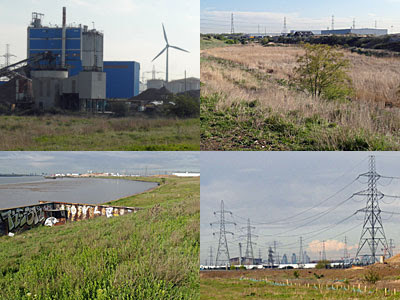 But it was the acres of landward prairie that drew my eye, mostly in surprise that so large an area of brownfield London lay undisturbed and undeveloped [photo]. Give it time. One single new building has crept in, a stack of silver containers creating Barking Riverside [photo]. This is an education centre, firmly shuttered at the weekend, but open to wide-eyed kids of all ages for ecological awareness during the week. In their grounds, dug into a long mound of earth, they boast the Guinness-approved "World's Largest Bee Hotel" [photo]. Residents can choose from two classes of accommodation - bamboo, or drilled logs - and every bedroom is guaranteed a river view [photo]. I genuinely wasn't expecting this. It's all change as the path turns inland to follow one of the ugliest roads in London - River Road [photo]. This is proper industrial, mostly of the waste and tipping variety, at least in those spots where anything commercial has survived. A guard in a turban sat at one entrance to ensure I didn't wander inside his tip and get accidentally dumped on, not that I would have. On one side of the road the site of Dagenham's Sunday Market, on Saturday an echoing void. On the other the rusted coils of the old Barking Power Station, whose dismantled acres are slowly being covered by a vast new housing development. You might have been tempted to live here had the planned Dagenham Dock DLR extension ever left the drawing board, but that was binned. Instead the East London Transit is due here next year, more a glorified bus, which'll increase services on River Road from two buses a day to several an hour. Until that promised housing spreads, the former frequency is by far the more justified. And finally into Creekmouth, a remote former village which is now essentially a pub surrounded by venues for manual work. Recycling's big here, and electrics, and engine-fiddling, and wholesale, and chucking mess in skips, and things that smell. There's only one nod to visitors, and that's a path between the warehouses to the mouth of the River Roding. 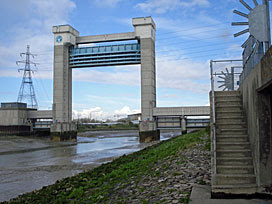 Here stands the mighty Roding Flood barrier, poised above Barking Creek like a giant blue guillotine in case one day its protection is required [photo]. You can get right up close thanks to a nature reserve squeezed along the river, courtesy of the Environment Agency and the Creekmouth Preservation Society. The barrier dominates, but that's Beckton Sewage Works opposite and the warning light at Tripcock Ness on the far side of the Thames. I arrived at low tide, most fortuitously, so followed the steps through a gate at the far corner of the reserve. Suddenly I was down below the protective wall, walking along an artificial foreshore colonised by spiky plants. The concrete staircase dog-legged down into the river, increasingly green and increasingly slippery. But it was oh so worth it for the reverse view of the barrier, rising tall and proud above defiant vegetation [photo]. Three miles of estuarine and industrial contrast, with a secret triumph at the end. Let's do Barking, then let's do Dagenham. One's a town that twice came to national pre-eminence, the other's a village that vanished. Compare and contrast. Forget Westminster. 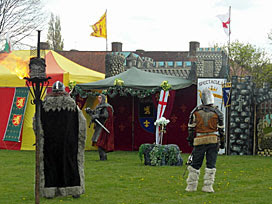 Barking used to boast the most important abbey round these parts, indeed one of the most important in Britain. It was founded in 666AD, which it has to be said is an especially inauspicious date, and perhaps hinted at devilish turmoil to come. The Vikings sailed in and razed the place, only for it to be rebuilt bigger and better (and considerably richer). In Norman times, to be abbess at Barking was to have the top female job in England, none less so than when Henry I's queen Maud took the role. The Abbey's wealth and influence endured for centuries, but even royal connections couldn't save it from Henry VIII's dissolution. 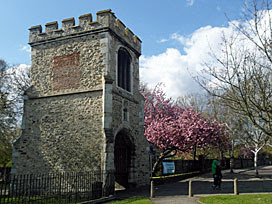 Only two gatehouse towers survived demolition, of which only the Curfew Tower remains [photo]. It's still used as the gateway into the grounds of St Margaret's Church (which is also medieval, and whose biggest claim to fame is hosting Captain Cook's wedding) [photo]. Step through the churchyard, however, and the remains of the abbey are still present. They were excavated 100 years ago, around the same time that town planners ran a road through the edge of the site. You won't see much, only the remains of a few snaking walls, but the extent of the abbey building is still striking. It's possible to stand where the high altar used to be and look out down the nave below... or it's possible to sit on a bench in the cloister and smoke marijuana, your choice [photo]. Whatever, it's a surprisingly peaceful place to be, and I suspect most of the residents lugging their shopping across the neighbouring open space don't even realise it's there. Barking's is one London's bigger street markets. Spilling along London Road and down East Street, it buzzes three days a week (and leaves an empty hole on the others). All the usual market stuff is here - shoes, sportswear and scourers, carpets, cauliflowers and cleaning fluids - for the discerning shopper in need of a bargain. A quick wander gives lie to the myth that Barking and Dagenham is some kind of monoculture. The sounds of reggae drift across the pavement, and there are queues for some very reasonably priced goat curry. In prime position in the central piazza is Julie's Fast Food Bar, serving burgers and pork rolls and (more recently) cappuccino. The flags of Spurs, West Ham, Chelsea and Liverpool flutter from her roof, which ought to keep almost all of her punters happy. Plans are afoot to squeeze in a new public square partway down East Street, to bring the market a little more upmarket, which has many of the existing traders worried. Some will have to move temporarily during the landscaping works, while others fear shoppers will no longer walk past the square as far as their pitches. You only have to look in the neighbouring piazza to see which way Barking's going. Three extremely modern blocks have sprung up, clad in as many coordinating colours as the planners could get away with [photo]. One's a library (sorry, Learning Centre), while down at the end is the residential Lemonade Building. Catch the afternoon light, or the golden hour before sunset, and it's a photographer's dream [photo] [photo]. But this nugget of modernity is in sharp contrast to the brick Town Hall on the fourth side [photo], or the ramshackle wall alongside (it's a modern folly, complete with sculpted ram on top) [photo]. Barking's trying to drag itself screaming into a new commercial age, to attract outsiders in, leaving insiders out. Dagenham, by contrast, was never historically important. A village on the Wantz Stream, rather than a fishing port, and with a small parish church, rather than an abbey. By 1653 it was still a single road, Crown Street, with cottages, almshouses and a proper Essex pub along the north side. Even as the village grew, many of these timber-framed properties lingered on, until (and you'll be expecting this by now) the Becontree Estate was built. In 1921 the population of Dagenham parish was 9000, but by 1931 (astonishingly) it was ten times greater. The heart of the community inexorably shifted from its old village nucleus to the new shopping centre on the Heathway. Any lingering nostalgia for a rural past disappeared in the mid-1960s when the council chose to demolish most of Crown Street to make way for new homes. Cottages dating back to the 14th century were summarily dismantled, rather than repaired, and almost all of the medieval high street was swept away. 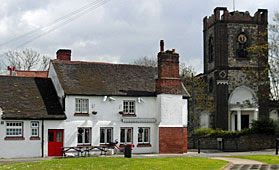 All that remains today is the church, the (not especially well-tended) vicarage and one of the three pubs. The Cross Keys is a splendid half-timbered building [photo], frequented by ale-quaffing old boys, and if you line it up across the faux village green the view might even make you believe you were in the country [photo]. But the eastern end of the street has disappeared beneath a hideously functional estate, all two-storey brick cuboids, much better for living in but vacuously grim. The borough museum at Valence House has a 10ft scale model of what Crown Street used to looked like before the developers came. See it and weep. I've visited many a football ground on these random borough trips, but only on a few have I hit the jackpot of turning up on the day of a home match. I struck lucky with Dagenham and Redbridge, stalwarts of League Division Two, playing their penultimate home game of the season against promotion-chasing Crawley Town. Unfortunately I did less well with my timing on the day, arriving too late to snoop around the exterior unnoticed, and too early to listen to the match over the fence. I turned down the cul-de-sac of Victoria Road, past ordinary homes whose residents pray this lot never make the big time, an awkward two hours before kick-off. Volunteers had just emerged to oversee the main entrance, waving traffic through into the private members car park as players or staff or whoever arrived. I thought it best not to proceed further, as I had no intention of buying a ticket or a replica shirt, so had to make do with a brief peer. The buildings beyond the gate looked like a classroom block and a warehouse, as somehow befits the non-Abramovitch end of the Football League. 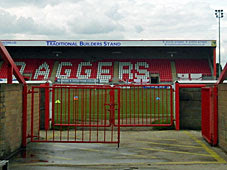 I got a slightly better view from the end of Bury Road, towards the stand where the white seats (amid red) spell out "DAGGERS". The intercom crackled to life, welcoming any supremely premature spectators to "The London Borough of Barking and Dagenham Stadium". You know your footballing brand isn't quite top flight when your main sponsors are the local council and the local funeral directors. Back in Victoria Road I passed Holty and The Merse dressed in red tops and grey sweat pants making their way towards the big game [photo]. A one-all draw, as it transpired, with that home goal sufficient to lift D&R out of relegation danger for the rest of the season. All credit to the supporters who pile into the stadium every fortnight, preferring Daggers to Hammers, and forever keeping the faith. Surprisingly few London boroughs bother to have a museum, let alone a good one. Westminster, Camden and Tower Hamlets have nothing. Harrow and Wandsworth's are disappointingly thin. Croydon and Islington's are too earnestly modern. But Barking and Dagenham's at Valence House, I'm pleased to report, is one of the best. The old building helps, but more importantly the way they've taken what heritage the borough has and presented it well, without resorting to the usual rooms of "local fossils" and "Victorian stuff". 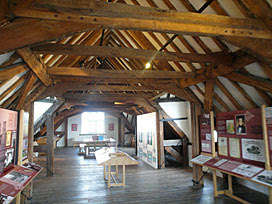 The history of the house makes its mark, including a restored parlour and a scale model of how it used to look. There's a proper skeleton, in a Roman sarcophagus dug up during construction along Ripple Road. Currently on long-term temporary loan is the Dagenham Idol, which is a rare Neolithic pinewood sculpture (and not a TV talent show won by local girl Stacey Solomon). One room is filled by two giant whalebones, formerly sited over a tollgate in Chadwell Heath to form an arch. More up to date are a mock-up of two rooms from the original Becontree Estate [photo], and screenings from the defunct Dagenham Co-operative Film Society, and a cabinet of R Whites fizzy drink memorabilia (they were from Barking, you know). One area's given over to famous people from the borough, of whom there are impressively many, including a recent Archbishop of Canterbury, and Billy Bragg, and Dudley Moore, and many more. 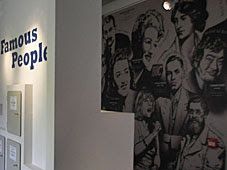 The displays were all recently updated, and it shows, with the right mix of text, objects and (not too much) interactivity. The staff are knowledgeable without being intrusive, so do stop and have a chat. And the upstairs toilet contains by far the most wasteful automatic tap I have ever used, which refuses to cut out until you've washed and dried and left and are halfway down the adjacent corridor. Just saying. Outside is a restored herb garden complete with pergola and rosebeds, behind which the Essex Beekeepers have a four-hive outpost. Further on, at a safe distance, is a slightly odd-looking bronze sculpture of a Ford Capri [photo]. And alongside is the borough's Archives and Local Studies Centre, which opened a couple of years back in a squat modern building. 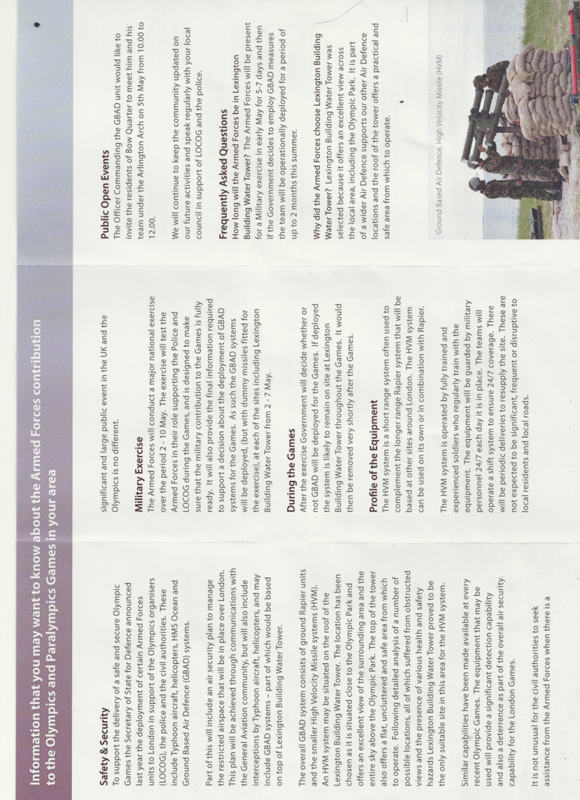 If you have family tree issues in the local area, this is where you come. Or if you just want a nice cup of tea, that too, in a café which appears wildly optimistic for its potential footfall. 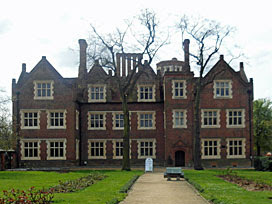 So look, if you fancy an atypical day out, or if you're local to East London and haven't been, I'll recommend Eastbury Manor House and Valence House with a number 62 bus inbetween. You won't be knocked sideways, but you'll gently enjoy, and I can guarantee you won't have to queue. The Harts Lane Estate will never win any prizes for architecture. Several families wait for the bus into Barking town centre, too lazy or too unwilling to walk the half mile into town. 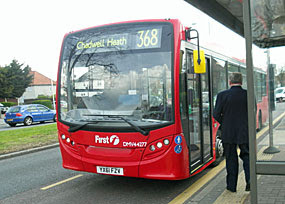 The driver takes a convoluted route round the town centre, displaced from the traffic-less main street where only the East London Transit may pass. One unfortunate bloke who just missed the bus outside the station catches up with it puffing and panting three zigzag stops later. Few seats remain. A man with a tattooed wristband and pig-themed baseball cap stands texting in the pushchair space. He moves when displaced by a small seated child, with both parents in suspiciously market-sourced Superdry jackets. A can of Stella rolls down the bus and spills across the floor. The driver fails to notice an old lady pressing the bell at Stamford Road. She dings in vain, holding uncertainly by the door for an unfortunate extra half mile to the next stop where she climbs down, muttering angrily. In Mayesbrook Park, the new SportHouse leisure centre looks like a mosaic of Bendicks wafer mints stuck to an aircraft hangar. The girl with "Gramps" tattooed across the back of her neck taps the screen of her mobile phone with long pink nails. Taylor pauses from testing his sister on the four times table, exhorting all his young friends to turn and watch the surveillance footage "on the television". He'll run back on board later to retrieve the Disney princess umbrella his sister left behind. Two kids sharing a bike wave from the pavement. I'm joined on the back seat by an adventurous toddler, probably two years old, with a Bench-branded woolly hat pulled down over his head. Mum sits in front, engrossed in her phone call, oblivious to her son's crescendoed pleadings. "Look at me!" he repeats, as he crawls up into the far corner of the seat with a grin on his face. "Mum!" doesn't work either, not even on the tenth attempt, until Green Lane arrives and she turns merely to demand his disembarkation. Blossom tumbles behind steamed-up windows. Few stay aboard until Chadwell Heath, where the lights flash, and the lady in a care-home tabard and I take the hint and alight.